Hergest - Their influences were West Coast (California) and their location West Coast (Wales). The 1970s was an exciting and pioneering time for Welsh-language rock. Hergest, with their mix of acoustic guitars and harmonies, made their mark as one of the most popular groups of the time - live and on record. 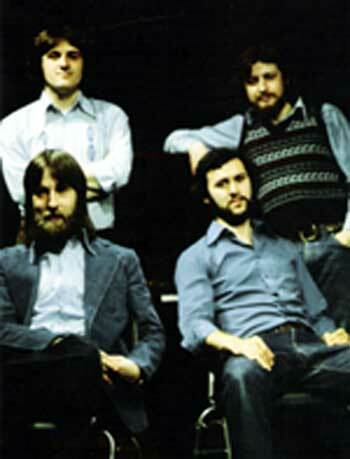 In the studio, they produced two EPs and four albums with songs that have passed the test of time like ‘Niwl Ar Fryniau Dyfed’, ‘Harbwr Aberteifi’ and ‘Ugain Mlynedd Yn Ol’. The individual members are still actively creating and performing new music, still share a strong personal bond, and in the twenty-five years since they stopped performing together, there have been a number of reunions, so the story may not be over yet. Glanceri is home to the group – its history, music and spirit – and the individuals that created it. Come on in – surf’s up!